So you are interested in owning a House Bunny eh! This page contains a list of questions, with my experience to date against each question. 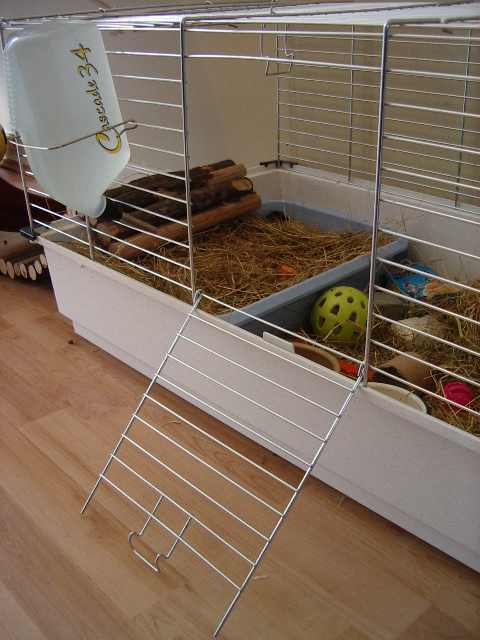 For a gallery of the top items you will need to look after your Bunny click here. For a gallery of cheap but effective Rabbit toys click here. From asking people who have Bunny's I have ascertained that Bunny's have unique personalities and basically you will have to get to know what that personality is. For example, some Bunnies take to using a lead very quickly and accept it, others you stand no chance. Are you house proud? You can still maintain a tidy home for when visitors come etc, but the times inbetween are when Bunny is allowed to roam. The Bunny is a member of your family and therefore should be treated as such. You will need chewable distractions from your tasty skirting boards and coffee table legs and these distractions will need to be available whenever Bunny is out and about. My coffee table is resting in four margarine tubs to protect the bottom of the legs which Rodney seems to find irresistable. Cables are very attractive chewable objects, for your safety and the Bunny's ensure that all cabling is out of Bunny's reach. Have you done your research? Although I was really excited about the idea of a House Bunny I did try to plan the whole thing. I bought a couple of books, asked advice from a colleague who had a house bunny just to answer my initial questions. I then rang 4 vets in the local area to gauge how much they charged for health checks, vaccinations for VHD and Myxo, and also for neutering. I visited all the local pet shops to see what cages were on offer. At the time I knew that we only had sufficient room for one rabbit. Rightly, or wrongly, I felt it best to get a rabbit that has been kept on its own - that way it wouldn't pine for lost friends. The books I bought initially were "The Complete House Rabbit", (which did scare me off a little at first because the author obviously had a big house and a lot of time to look after the buns, however if you actually ask people e.g. through newsgroups, for their experiences you'll understand that everyone's situation is different anyway) and "The House Rabbit Handbook". I bought Rodney from the petshop where I found the cage to suit my needs. The petshop had been recommended by another House Rabbit owner. This is useful as you know in advance that they should be able to answer any queries. Have you enough room for the cage? Work out where you would be keeping the cage - how much space is there? Most pet shops now sell House Rabbit homes. The key factors are the size of the Rabbit and the size of the space. children that visit you often? I was not aware that Rabbits are not overly keen at being picked up. Rabbits can be timid creatures when faced with an over enthusiastic 2 year old. I read in the books I bought that ideally if you were buying a Rabbit for a child, not only should you be prepared to look after it yourself (should the worst happen and the novelty ebbs away) but the majority would recommend a child is around 7 years + to fully understand the ins and outs of Rabbit care. I do have children who visit, 2 and 6 years of age. The first visit went well because I wrote them a letter, from Rodney, explaining how to approach him and what it is like for a rabbit being faced with eager kids. In the end the 2 year old ran away from the Rabbit when Rodney sneaked up on her when she wasn't looking. of humour? Rabbits have their own mindset and if they don't want to do something they will do everything they can to get out of it! One example if trying to get a Bunny used to a lead, another (recent) example is trying to catch a Bunny when you are trying to clean poo off that has stuck to Bunny's bottom ! Can you afford to keep a Rabbit? Basic question, but in some bunny's problems with the teeth could end up costing quite a bit. There are insurance policies available e.g. Petplan but check what they cover. It approximately cost £13 per vaccination (VHD and Myxo) and they'll need those every year. Neutering costs anywhere between £40 and £50. Because Rabbits are known for being delicate when it comes to the anaesthetic it costs a little more for the operation. Add on the cost of Hay, Feed, Sawdust etc. Cost may not be an issue for some but if you have only been used to keeping Hamsters or the odd Goldfish then you need to understand the costs. Do you take a lot of holidays or weekend breaks? Rabbits do need company, and a routine of sorts. If you do go away a lot who will look after the Bunny when you aren't there? Physically and mentally the Bunny can be OK for odd day/night if you are away but on a persistant basis if they are left alone restricted to the cage their physical and mental wellbeing will suffer.